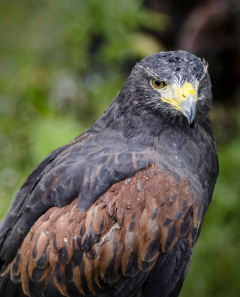 The Cornell Raptor Program was established in 1993 to provide Cornell undergraduate students and other community members an opportunity to become involved directly with efforts to promote conservation of birds of prey. New Students – Interested in volunteering? Check out the Volunteers page for details! The Cornell Raptor Program is currently creating a new enrichment program for our birds! If you want to help us provide a more interesting environment for our birds or send us supplies for our program, check out our wishlist! Items should be shipped to the Cornell Raptor Program, c/o Heather Huson, 507 Tower Rd, 201 Morrison Hall, Ithaca, NY 14853.